This is a powerful moment in history. Youth around the world are taking a stand, raising their voices together and demanding change. And British Columbia is no exception. 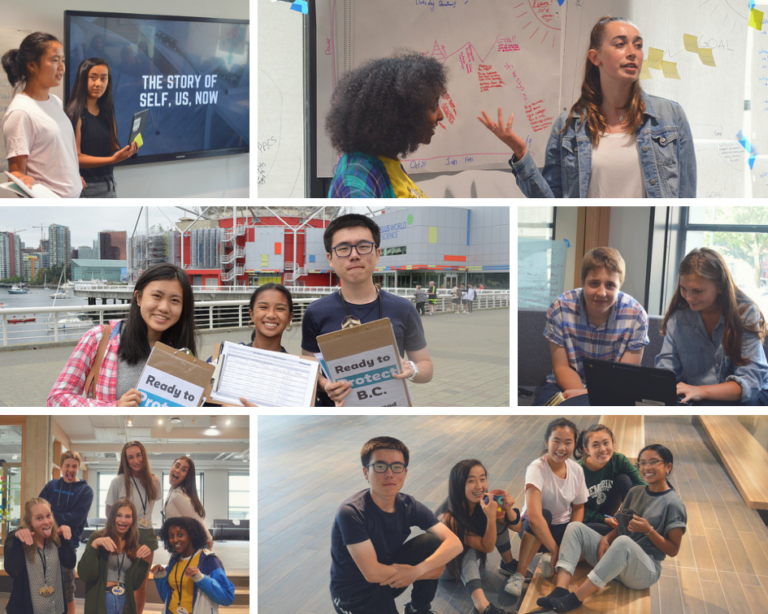 We believe with the right skills and tools, British Columbia’s youth can be even more effective change-makers in their home communities. 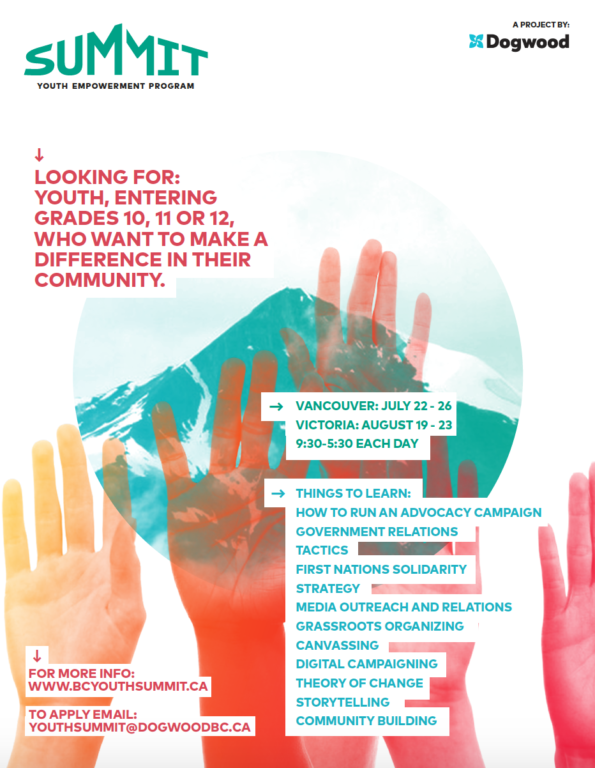 We’re offering an intensive five-day program that combines theory with real world practice, designed to arm young British Columbians with the campaigning and organizing skills they’ll need to make a real difference. Dogwood has a 20-year history of successful campaigning in British Columbia. Through grassroots organizing and political action, in solidarity with First Nations communities, we work to put decision-making power back into the hands of local people. We are probably best-known for our longstanding No Tankers campaign, defending the West Coast from the Northern Gateway and Kinder Morgan pipeline proposals. We also ran a campaign to ban Big Money, which helped usher in historic election finance reforms in B.C. Over the years, our staff have supported and nurtured activists fighting for a better future in communities all across the province. You are a British Columbian about to enter grade 10, 11 or 12, who wants to be a leader in your community and beyond. You are interested in current events and have a passion for politics, social justice or civic engagement. Most importantly, you want to be a catalyst for change. You might have an idea for a campaign to kick start, or just have that urge to make change in B.C. Maybe you’re already making a difference in your community. Either way, you’re looking for more skills, connections and tools to scale your impact. If there is capacity, special considerations will be made for exceptional applicants who are younger than grade 10. We aren’t going to sugar coat it — this is an intense week! But by the end of the week, you will have designed your own advocacy campaign from start to finish — an incredible accomplishment. We design winning campaign strategies. 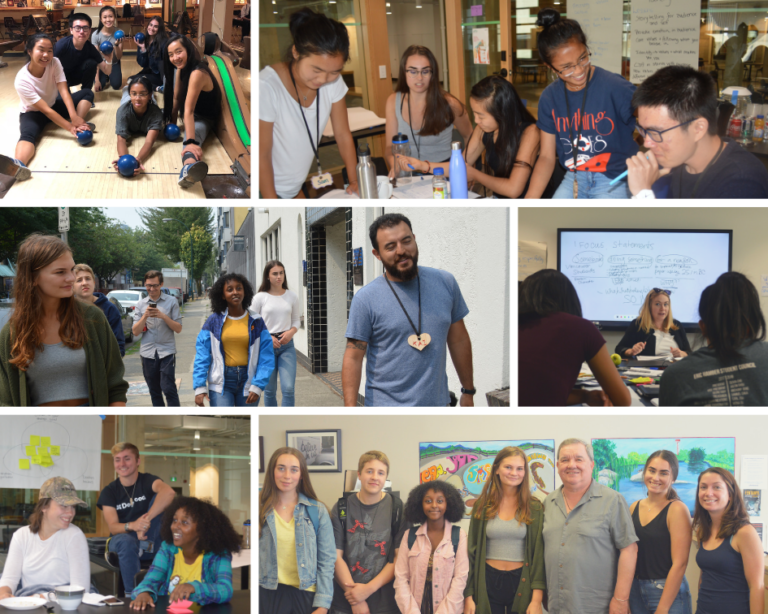 We will help you come up with your own campaign idea, then show you the ropes: how to set ambitious but achievable goals, figure out who your decision-makers, allies and opponents are, write a theory of change, come up with fun and effective tactics and then tie it all together in a timeline. We provide hands-on training. We give you guidance in how to talk to decision-makers and then put your skills into action, visiting a local MLA’s office. We bring in experienced journalists to teach you how to get media attention and what to do once you have it. We also go canvassing with a petition — helping you to connect with people who share your dedication to change. We are dedicated to the place we live. We want to immerse you in the community — its history, its challenges and its opportunities. We bring in inspiring and interesting guests from local First Nations, community organizations and neighbourhood groups. We do all the other essentials, too. We show you the importance of story-telling and help you develop your own public narrative. We help you practice your public speaking skills. We talk about self care, so you can have a long career of making the world a better place. And we have fun. We work hard to create a safe, inclusive space for you to learn and have fun in. Trust us, there is nothing more exciting than connecting with other people who share your values and vision for the world. 312 Main Street, Vancouver B.C. theDock: 300 – 722 Cormorant Street, Victoria B.C. This is a day camp — no overnight accommodations are provided. Cost: $330 (includes GST and processing fees). Lunch and out-of-classroom activity costs are included. No applicant will be turned away because of financial need. Scholarships and needs-based bursaries are available. Please indicate on your application if you need financial support to attend. Download the applicable form below and complete the application, then send it to youthsummit@dogwoodbc.ca. We will be in touch shortly after your application is received. Application deadline is June 7, 2019. Applicants may be accepted on a rolling basis, so get your application in as soon as possible. We encourage all young leaders to apply including members of visible minorities, Indigenous persons, and persons of all gender identities and abilities. Have questions? Send us an e-mail at youthsummit@dogwoodbc.ca.